If you’ve always wanted to try rice wine, but never had the guts – now’s your chance! This Sunday 27th Sept come to try two very special ones for free! The first is Namacho Sake – an excellent semi-dry honjozo with aromas of rice and yeast. It has a fresh, light flavour with a hint of creaminess as it has only been pasteurised once. It is recommended with crisp salads, tempura or deep-fried dishes and is best serve chilled. 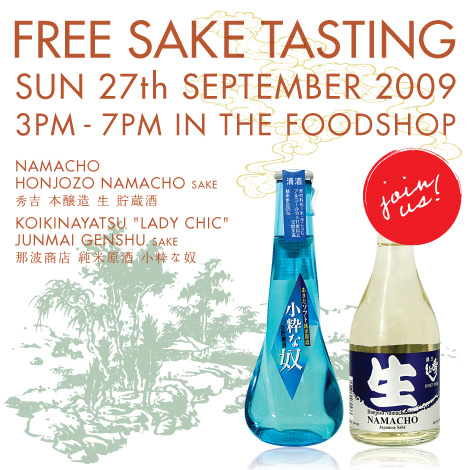 The second is Koikinayatsu “Lady Chic” Sake – a fruity, refreshingly sweet sake which is undiluted, yet low in alcohol. It is a namachozo, having also only been pasteurised once and therefore has a fresh flavour with hints or rice. It can be enjoyed as an aperitif, chilled or on the rocks, and is recommended with smoked salmon. Come to the Foodshop from 3pm at Japan Centre, 213 Piccadilly, London. See you there! Posted in Food and tagged Sake, tasting. Bookmark the permalink.